The nondescript room at Chennai’s IIT Club in East Abhiramapuram suddenly came alive with her arrival. ‘Bombay’ Jayashri—as she is lovingly known owing to her musical beginnings in the city—smiled at us, serene in an orange-and-black handloom sari and simple silver jewellery, her expressive kohl-laden eyes reflecting warmth and honesty, striking the perfect note for a three-hour tête-à-tête. 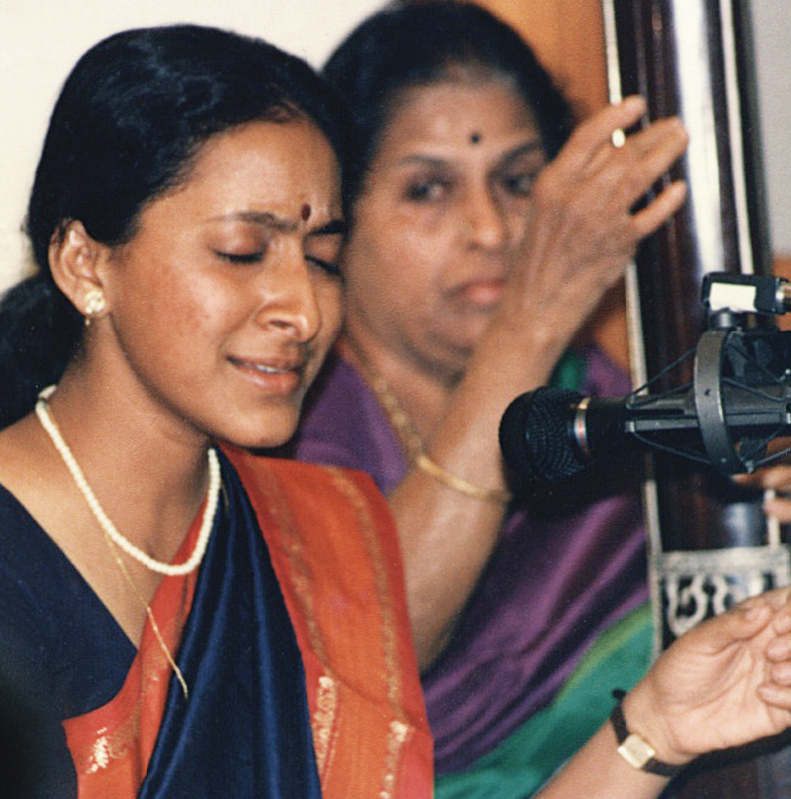 A singer, composer and teacher with a career spanning over three decades, Jayashri is one of the most sought-after musicians on the Carnatic music firmament today. That said, from Hindustani, Sufi and Arabic music to Western symphony, devotional music and movie numbers, she straddles every musical genre with élan. Whether highlighting the angst of Meera in Bhaire baaware or rendering verses from the Tamil epic Silappadikaram, her silken voice has a meditative quality that brings music to life. Indeed, as I savour each composition in her mellifluous voice, a profound feeling of calm embraces me and I break free of all rigidity and prejudices. This subtle awakening is undoubtedly experienced by fellow aficionados and connoisseurs of music when they hear her evocative renditions. Hailing from an impressive lineage of musicians, it was evident Jayashri was blessed when, as a child of three, she flawlessly hummed a difficult segment of a composition in Ranjani raga that her father N N Subramaniam’s senior students struggled to sing. 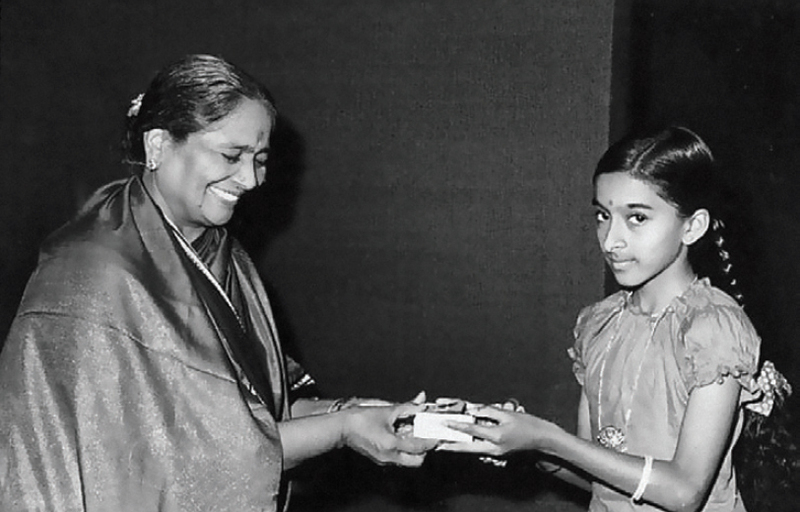 Her mother Seetha was perceptive enough to recognise this innate talent and determined to hone it to perfection. 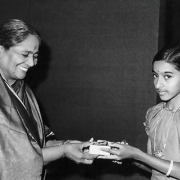 Thus, began Jayashri’s musical journey—she trained under great maestros of Carnatic and Hindustani music including T R Balamani, Lalgudi G Jayaraman, Mahavir Jaipurwale and Ajay Pohankar. Her constant search for newer horizons has made her venture into every aspect of music—she sings, composes music for dance productions, conducts workshops on world music and collaborates with international artists. With a belief that classical music has no boundaries, she has taken music to rural areas and beyond borders. 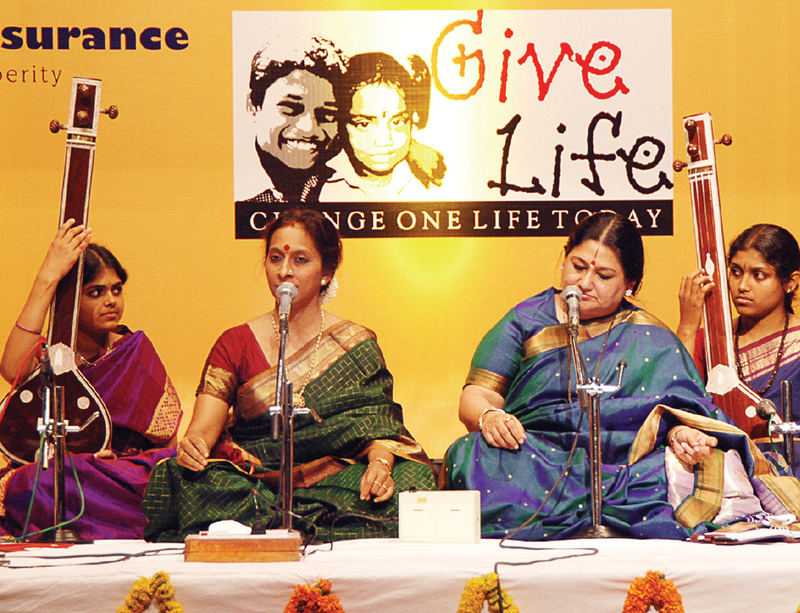 And her experiments with music therapy have extended to a plethora of social causes. Hitham Trust, which she founded in 2013, is one such effort to share music with children with autism and those living in rural areas of Tamil Nadu. Not surprisingly, the Kolkata-born, Bombay-bred, Chennai-based vocalist, who debuted in 1982, has been flooded with awards, such as the Sangeetha Choodamani Award (2005), the Vishwa Kala Bharathi Award (2014) and Sangeetha Vedantha Dhureena Award (2015). As one of India’s leading cultural ambassadors, she has performed across continents. In fact, from Bahrain to Sydney, Toronto to Singapore, the last three months have been a whirlwind of tours. Now, with the much-awaited December music season in Chennai set to begin, Jayashri is home, ready to mesmerise her audiences with her soul-stirring voice. As I take leave of her, the scribe, the rasika and the spiritual seeker in me merge into a single entity—I say a silent prayer that she continues to soothe bruised spirits and hungering souls for decades to come. Tell us how your musical journey began. What role did your mother play in shaping you into a musician? My father was the first person from whom I learnt, for a brief period. Though the memories are hazy as he passed away when I was seven years old, I remember the songs I learnt under him and feel I still sing them the way he probably did. I have not trained directly under my mother, but she has been like a beautiful canvas umbrella… a shade… always pulling me to a guru, taking me to classes, making me practise consistently and sending me to competitions. She has been a guiding force with just one dream: that her daughter had to perform. She would do anything to achieve it but I didn’t see meaning in this. I would react like any other kid of that age; I would cry, sing without interest, fight and rebel because my friends would play, go for picnics and participate in so many things my mother thought were a waste of time. “You’re not going… you have to sing, that’s all,” she would declare. She worked against many odds to make me a musician. Would you say your brothers, who also trained in music, escaped this rigour? I used to use the word ‘escape’ when I was a child. Now, I feel what she has given me is a treasure. Though both my brothers pursue careers in the corporate world, they keep abreast of my musical journey and are my best critics. You received your Carnatic music training from guru T R Balamani, along with accomplished singer Shankar Mahadevan, we hear…. We were a bunch of four very good friends, including Shankar. On our way to the music class by bus, we’d yak away about all subjects other than music! On our 2-km walk from the bus stop to our teacher’s house, we’d stop to share a bhelpuri with all the money in our pockets. Those were the days when we had no plans, no agenda towards work! You also trained in Bharatanatyam and the veena. How did vocal music take precedence over them? Veena happened to me much later upon the suggestion of my guru, the legendary Jayaraman sir. He said learning an instrument would aesthetically enhance my vocal capacities and give me a better understanding of the nuances of Carnatic music. The apartment complex in Chembur, Mumbai, where we lived, was an energetic one with groups of children performing music, dance, drama and bhajans almost through the year. I too wanted to learn dance. Somehow my mother agreed and I began learning at Sri Rajarajeshwari Bharatha Natya Kala Mandir. When it was time for the arangetram [stage debut], my mother decided I had learned enough and it was time to stop. For the arangetram, we were doing a padam [a type of composition] that, for a 13 or 14 year-old, was the height of achievement and I was looking forward to the practise sessions. On the first day, I was in class 10 minutes early and was thrilled when my teacher Nagarajan sir asked me to come forward. But I was in for a rude shock when he told me that I would sing the padam, while the rest of the group would dance. My eyes welled up with tears but I did not show my emotions. At the end of the session, he told me that, henceforth, I would sing while the others danced. That was my final dance class! I felt completely dejected and experienced a sense of rejection as I felt my master thought I was not good enough to dance. It didn’t matter to me if he thought I was a good singer. Your guru Lalgudi Jayaraman embraced all musical genres and was equally appreciative of Mehdi Hassan and Michael Jackson. How did this influence you? Yes, we’d listen to Mehdi Hassan and Lata Mangeshkar and watch Michael Jackson together. All through my younger days, I was part of different genres of music—I used to sing ghazals, Marathi songs and at the Navaratri garbas. I would sing film music of the 70s and 80s. With Jayaraman sir, I felt I had reached the destination of a highly aesthetic person who could appreciate different forms of beauty and that reinforced my ideas. 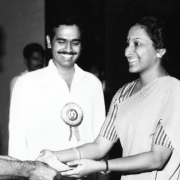 In fact, I shifted to Chennai in 1985 to train under him. You have composed music for operas such as Samradhya and Silappadikaram. Is this a way of satisfying your passion for dance? It could be [laughs]. 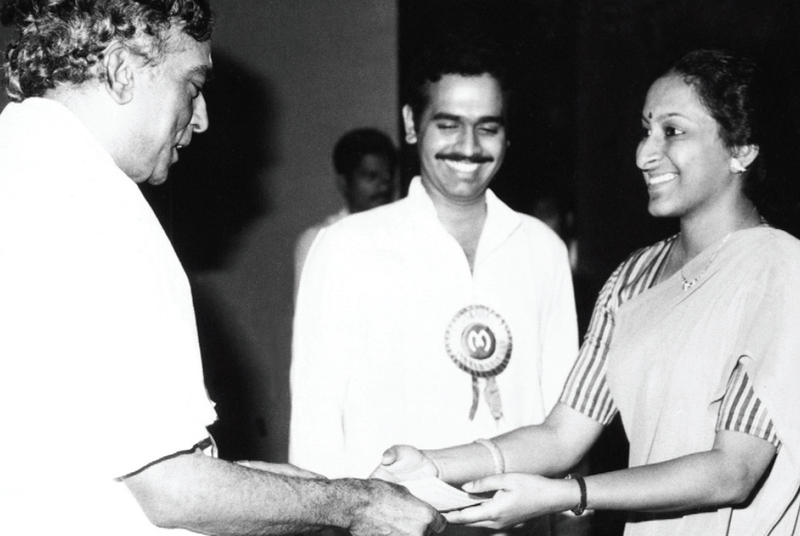 Even before I started composing, I collaborated with several dancers including Leela Samson, Priyadarsini Govind, Alarmel Valli, Chitra Visweswaran and Sheejith Nambiar. I loved to see music through the eyes of a dancer. This probably was satiated in a small measure when I learnt dance myself but the search continues in me because I love the language of Bharatanatyam. So you’re quite right. Though you had done playbacks in the past, the songs Vaseegara in Tamil film Minnale (2001) and its Hindi remake Zara zara in Rehnaa Hai Terre Dil Me catapulted you into another league. Did this popularity bring larger audiences to your Carnatic music concerts? When Vaseegara happened, it was an amusing case of mistaken identity. I had just returned that morning after a concert in Coimbatore and someone at home told me Jayaraj sir had asked me to come to the studio at 2 o’clock. I assumed it was a call from the great Malayalam director Jayaraj for whom I had sung a few purely classical songs. When I arrived at the studio, I was taken aback—there was an entirely new crew. Suddenly, a young boy in shorts appeared and introduced himself as Harris Jayaraj! I tried to excuse myself by saying that I sang in a very low pitch. He said, “I have heard your Carnatic music and I want you to sing in that low pitch.” I didn’t know how to back out of the recording! When the music released, even before we knew, the song was blaring out of autos, tea stalls, etc. My istriwallah was ironing my saris better after that! The song definitely brought larger audiences to my Carnatic music concerts, if only from curiosity. They came—and they have stayed. How did you bag ad jingles? 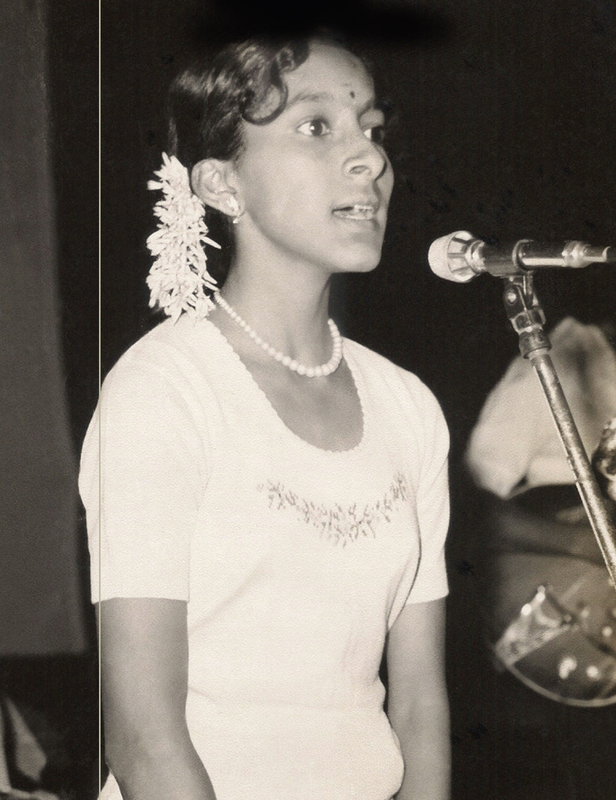 I used to participate in and win singing competitions at my school, St Anthony’s Convent in Chembur, Bombay. Ad agencies would attend these competitions looking for new voices. Thus, I landed an assignment for Pond’s Dreamflower. Several others, such as Rexona and Bournvita, followed. What has been the highlight of your experiments with world music? The association with Finnish composer Eero Hämeenniemi; I got to sing with the Philharmonic Chamber Orchestra of London with 101 musicians and take the music to places like Lapland, Hungary and Germany where Carnatic music doesn’t normally get an audience. It was very challenging because I am not a student of Western music and cannot understand the trajectory and nuances. How do people in other countries react to Carnatic music? I recall an interesting instance from one of my concerts in South Africa attended by the Zulu King and Queen. 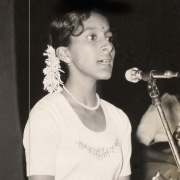 I was singing my guru’s thillana [a rhythmic piece in Carnatic music usually sung towards the end of a concert; also as a dance piece] in raga Desh when a Zulu woman from the audience came up and asked if she could dance to the piece. I agreed and was very thrilled by the way she danced. At some point, I realised her movements blended beautifully with the thillana! In 2007, you co-authored a book, Voices Within Carnatic Music: Passing On An Inheritance, with Carnatic vocalist T M Krishna and Mythili Chandrasekharan. How did then President Dr Abdul Kalam happen to launch the book? The book is on the life and works of seven eminent Carnatic musicians. We wanted Dr Kalam to launch the book as he was a lover of Carnatic music and a veena exponent. He readily agreed on the condition that Krishna and I sing together at Rashtrapati Bhavan. It was a 45-minute concert that we rendered together for the first time. You have collaborated with T M Krishna on several other projects…. Yes. Svanubhava Festival is one of them. Established in 2008, it is an annual festival to celebrate the performing arts, and probably only one of the few for students, by students. 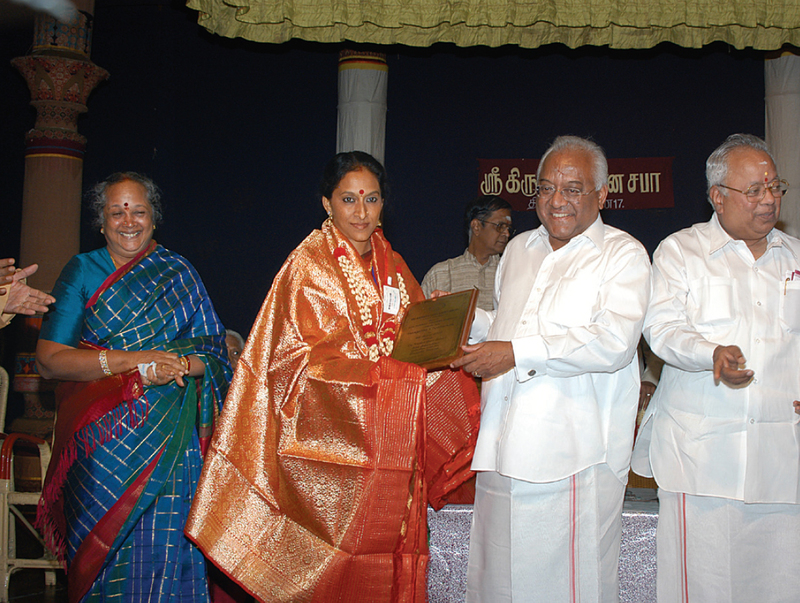 During Carnatic music concerts, we had observed a dearth of youngsters. We wanted to create an environment where children could attend music sessions during school hours, without parents accompanying them. We wanted to allow children to have their own atmosphere and build realities of their age without being intimidated by adults. The concerts are short, followed by a brief interactive session between children and the maestros. Please share your experience singing Pi’s lullaby for the film Life of Pi (2012). As a mother, you must have sung lullabies for your son too…. The movie’s director Ang Lee and composer Michael Danna wanted an Indian voice to significantly emote Pi’s mother. More than a lullaby, the song was the emotional connect between mother and son through several points in the film. It was also a connect between the audience and the film. It took them a while to get what they wanted out of my voice. As for singing lullabies for my son Amrit, he wouldn’t sleep very easily. As I would sing for him, my husband Ramnath would carry him and pace up and down. For the first three years of his life, when we’d think he had gone to sleep, he’d be up and conversing! How would you manage when he was a baby? I had a cooperative household—very understanding in-laws and husband, and my mother and brothers were there to help as well. I had a good support system. He was never alone and I didn’t have to worry about him when I had a concert. Is Amrit also learning music? Yes. He was blessed to start his music lessons on the violin under my guru Jayaraman sir. What was the trigger for your experiments with music as therapy? The trigger was Prakash, a 10 year-old child with autism whom I met in Dubai 15 years ago. He came up to me after my concert and said I had sung it all wrong, in an audience where everybody told me only nice things. This child had courage and honesty—his intent was supreme. He couldn’t come to terms with my giving less than 100 per cent and felt let down. This is how I looked at it. That comes from someone who really loves you. Subsequently, I came across several other children with autism who were musically gifted. I think it was a message from the Gods that I should reach out to these children. My students and I started going out to schools for children with special needs in Chennai and singing for them. This eventually led me to establish Hitham Trust with my students. We have two programmes for children with autism: Manas and Swayam. Manas is a group class where there is only engagement, no expectation. Swayam is a one-on-one programme where we teach music to the children. How do these children respond to music? There were children who were restless and would storm out of the room. Some were even a little violent. But over a period of three months, they calmed down. Sometimes, children who were non-verbal—not having uttered a single word—have started singing! These children love being in the space of music. You have also been teaching music to rural children in Tamil Nadu. How is the experience considering their non-musical background? It is true that they come from very humble families and have had no prior exposure to music. But this lack of exposure has its advantage. They know nothing; it’s a clean slate. Therefore, the impressions we are able to form are very deep. Now, at the end of four years, I can say that we have really reached somewhere. The children feel that music has changed their lives, their home atmosphere, the way they perceive aesthetics. They also claim it helps them get better scores in maths and science. So music here is education at a different level. You are also associated with organisations that help cancer patients, orphans, destitute and mentally challenged women, and those suffering from multiple sclerosis. What inspires you do this work? It goes back to my school days. We used to sing for social causes at orphanages, senior citizens’ homes, etc, and I used to love it. What I do now is an extension of that. Recently, I got a lovely opportunity to sing for the inmates of Puzhal Central Prison, Chennai. After their initial inhibition, they all started singing with me. They asked me to sing some compositions of Tamil poet Subramania Bharati. Music is a great leveller! Do you encounter criticism? How do you deal with it? Yes, indeed. It happened even recently. I came out of a concert feeling I had done my best. And a 75-80 year-old woman, who has been listening to my music for almost 25 years, said the concert was not up to her mark. It must have taken her a lot of courage to tell me that; there were a lot of people around us. Though I was dejected, I wrote to her later, saying: ‘Thank you for bringing this up to me. I will definitely introspect and look at where I can go from here.’ Often, as performing musicians we are caught up in so many aspects of concert rendition that we lose out on something else. I do feel sad when I hear these comments. But this is an impetus to work harder. How has Carnatic music evolved over the years? How do you see its future? Changes are happening in several facets of the music. And it is a period of boom. 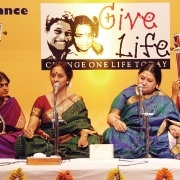 The number of organisations promoting Carnatic music is burgeoning. Many youngsters are practising seriously and taking it up as a profession. Carnatic music is being performed in every part of the world; I hope we keep its sanctity, purpose and intent intact. I have become quieter, not that I was very talkative. I have fewer questions to ask of myself; I have become more accepting of some changes. And the more I sink into the music, the more I’m able to forget everything outside. What does music mean to you today? At different stages in my life, I have defined or answered this question differently. It has been my passion, my life, my goal, my work, at various points of time. But at this point, I feel it’s the only thing I love to stay with through the span of the day. It’s the only thing I know a little about and I’m comfortable being with it. What are your views on e-learning? Today, students record training to reinforce their learning. I know there are several online platforms, like Skype, that can be used to teach and learn. However, I don’t use them; it’s a very non-personal approach to a very beautiful art. I prefer personal interaction and face-to-face teaching-learning. However, I appreciate technology’s role in maximising the reach of music through various channels and enhancing the quality of music through good acoustics and other aspects. What are your plans for this December season in Chennai? December season is always like an examination where you’re watched and judged, no matter who you are or for how many years you’ve sung. I want to sing some new compositions this time and relook at ragas in a new way because there is so much to explore. There’s a huge feeling of responsibility and pressure to prove yourself. Hopefully, with the blessings of my gurus, I will succeed. Please share your message for silvers. 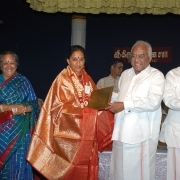 A lot of seniors, particularly in South India, have learnt music in their younger days. I would request them to use this learning to bring joy to people who need it the most, in places such as palliative care centres, senior citizens’ homes and schools for special children. Music is indeed therapeutic.